Chris Berman: While he was a coaching intern, Tomsula earned money on the side as a battery separator. Trent Dilfer: Is that right Chris? Chris Berman: Yep, Trent. He used to go through used batteries and pick out ones that had a bit of charge left in ‘em. Trent Dilfer: At our broadcast meeting earlier this week, Tomsula actually told me that he was employed as a Tilt-A-Whirl operator during the spring of 1984. Trent Dilfer: You know Chris, one of those amusement park rides? Yeah, he was part of a traveling group of carnies that set up in towns across the upper midwest. Trent Dilfer: This game may be sloppy, but we’re seeing some WOOD LAID EARLY ON! Which reminds me, Jim Tomsula used to lay wood on maple trees. You see, he once traveled to Canada to apprentice as a maple syrup tapper, but found the lifestyle was too ostentatious. Chris Berman: You know, Trent, while Jim Tomsula worked as an assistant coach for the 49ers, he had a nighttime job as a junk mail reader. You’d hire him for an hour, and he’d open up all your junk mail to make sure you weren’t missing anything good. Trent Dilfer: That’s what you want from a coach, Chris. A willingness to do literally anything. Trent Dilfer: Did you know that I live in Marin outside of the season, Chris? Chris Berman: No I didn’t, Trent. Trent Dilfer: Anyway, earlier this offseason I went the library to drop off a book on tape, and I ran into Jim Tomsula. Chris Berman: Is that right? Trent Dilfer: He was collecting nickels from the wishing well, a habit he picked up decades ago. It was a profound experience, Berm. He told me that the only way real men make their dreams happen is through hard work, not wishing. Trent Dilfer: Yeah he found a Sacagawea dollar, which taught him the importance of persistence. He kept that coin as a reminder, and actually used it as a theme in tonight’s pregame speech. 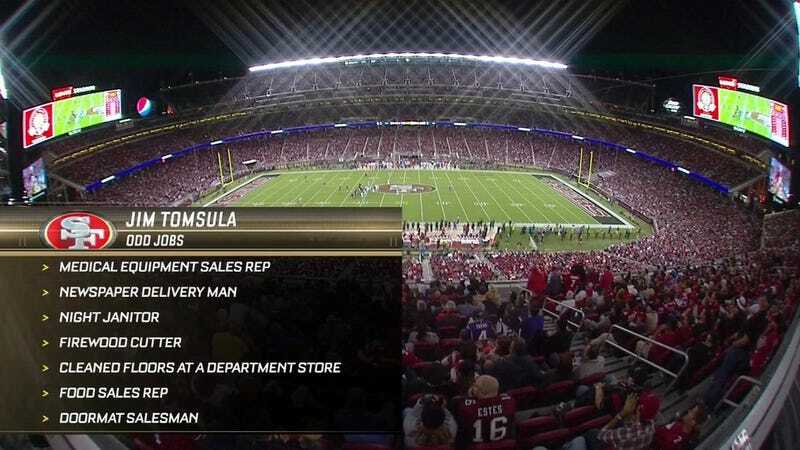 Chris Berman: Imagine, Trent, three years ago, wealthy children hired Jim Tomsula as a living piñata, and now here he is, coaching in the NFL.